This time there’s more notice. Many in our faith community say they would have attended the last Evening of Silence at St. Mary’s Episcopal Church if they had known about it in advance. Here’s your notice. 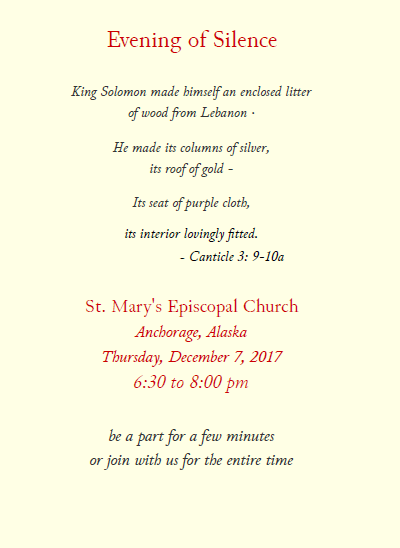 This coming Thursday evening, 6:30-8:00 p.m., St. Mary’s Episcopal will once again open it’s doors for a period of silence to come, sit, kneel, reflect, and pray in a holy setting. Many of us need to come apart from our dwellings to experience the joys of communing with the divine. There are so many distractions which separate us from practicing the spiritual disciplines of prayer, and fellowship. It’s a benefit to us all, that St. Mary’s is one of the few churches in the local area that open its doors for this purpose. Due to vandalism, theft, desecration, and lack of respect, many churches do not open their doors other than for established meeting times and purposes. You are free to come and go as you please during this time at St. Mary’s. A litany book was prepared by Heidi Marlowe for the last evening of silence. It was a thoughtful, quiet method to bring ones heart to a time of quiet internalization through Christian litany. Come for a few minutes or the entire hour and a half. It’s up to you. Thank you St. Mary’s community for leading out in this meaningful opportunity of faith. 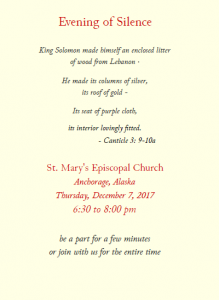 This entry was posted in Church Visits Blog and tagged Evening of Silence, St Mary's Episcopal on December 2, 2017 by Chris Thompson.